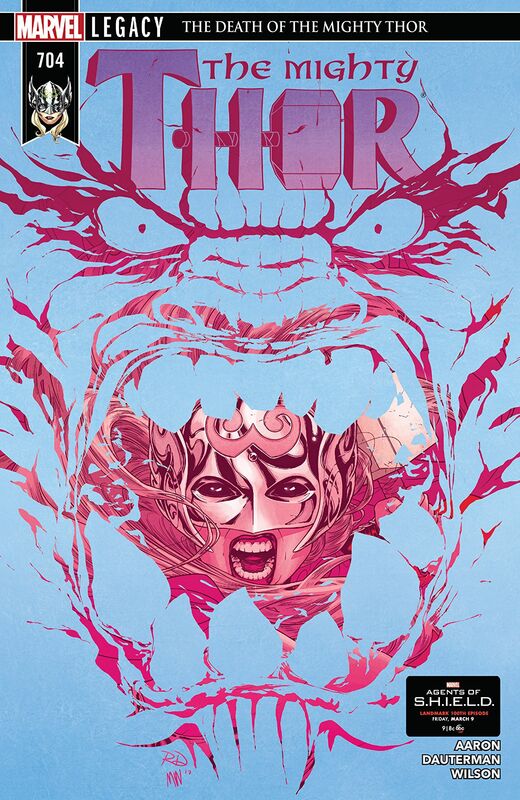 The Mighty Thor #704 Review – AiPT! There is something special happening in the pages of The Mighty Thor that will stay with me for a long time. Beyond the phenomenal art and color by the ridiculously talented Russell Dauterman and Matthew Wilson. Beyond the thoughtful and meaningful writing of Jason Aaron. Going back to the beginning, casting Jane Foster as Thor was a risk in so many ways. What’s happening now, though, is an exploration of faith in a world where the gods are real and tangible. There is a duality to the story that rises above what would be stereotypically comic book material, but I truly believe there is no other way I’d rather see this story told. Jane Foster is dying. Asgardia is dying. Both are ravaged by an unstoppable beast with no apparent cure. Both have taken every solution thrown and laughed. As Jane’s cancer saps her strength and vitality, so has the Mangog, breaking the gods of Asgard one by one. Jane spends her time, as many cancer patients must, contemplating the meaning of death and faith. Her mother, lying on her own deathbed while Jane was a child, asked her to seek God on her own, a daunting task for a child. As an adult, Jane confronts the death of her father, the last family she had. Later, after Thor entered her life, doing what mourners everywhere would love the chance to do, she slaps the god of thunder in the face, asking him what good any of them were when her ex-husband and son died in a car crash. Now, alone again by choice, what faith does Jane have left? In Asgardia, the anger and rage that are the Mangog rail against Odin and his son, taunting them mercilessly as it destroys everything around them and batters their bodies. No matter what they do, it does not falter in its quest to destroy everything the gods of Asgard stand for. Throughout, the Mangog mocks the gods for not only their own faith in themselves, but for the neglect they represent: prayers gone unanswered, cries for help gone unheeded, all while the petty gods squabble amongst themselves. We see this embodied in the new Sorcerer Supreme, Loki, who returns to Asgardia in an attempt to save his adopted mother, Freyja, whom he literally stabbed in the back. She rejects him, choosing to fight for her husband, son, and her people. The choice to fight. The rejection of empty, unanswered, perhaps undeserved faith. The wanton destruction with little hope of survival. The choice. In the end, Jane Foster makes her choice. Whether she wins her battle or loses, she made her own choice. No god forced her hand, no person influenced her. Through all her struggles, Jane is, no matter what, her own woman. Jane Foster is worthy. Whether she wins her battle or loses, she made her own choice. No god forced her hand, no person influenced her. Through all her struggles, Jane is, no matter what, her own woman. Jane Foster is worthy. Absolutely none. This issue is perfect.